It’s easy to fall into old habits, it’s comfortable and it’s quick, it’s wonderful — until you realise that you’re not getting as many engagements and purchases as you used to. Even the most loyal customers are fickle beings, so you always have to be on the look-out for new ways to keep their attention. Refreshing your strategy comes down to doing a list of individually tiny things, it’s only when they come together that things get interesting. Who is your intended client base? Has your client based changed over time? Are they trying to solve a specific problem, or just browsing? Are there specific pain points that visiting your site can solve? Is it time to revamp your old methods, or to try entirely new ones? A good salesman varies his techniques depending on who he’s trying to sell to, and so should you. Think of it this way, a salesman trying to sell a flashy sports car to someone in the grips of a midlife crisis, is going to have a pretty easy time of it. But there are still going to be days when they’re trying to sell the same car to a penny pinching little old lady. Both are opportunities to sell, so how do you do it? First of all, you need to be thinking about who your ideal customer is. Picture them as a character in your mind, what are they like? What makes them your ideal customer? Which of your products appeal to them most? Why is that, and how can you make them interested in even more? Landing the initial sale is just the first step. Then, ask yourself, are you going to be connecting with your visitors on a rational level, or an emotional one? Emotions are great to trigger one off purchases, but for repeat customers, there has to be a degree of logic involved. What are you offering that others don’t? There are great products everywhere, and it’s not enough to be above average anymore, you have to have a great message or selling point too. So if you have a message, what is it? There’s nothing more frustrating than the feeling of being misled, so if you’re trying to convey a specific message, it needs to be clear. Effective copy gets to the point, quickly. Twitter keeps it to 140 characters, we’re not saying that your points or ads should be that short, but, as Shakespeare put it, brevity is the soul of wit. 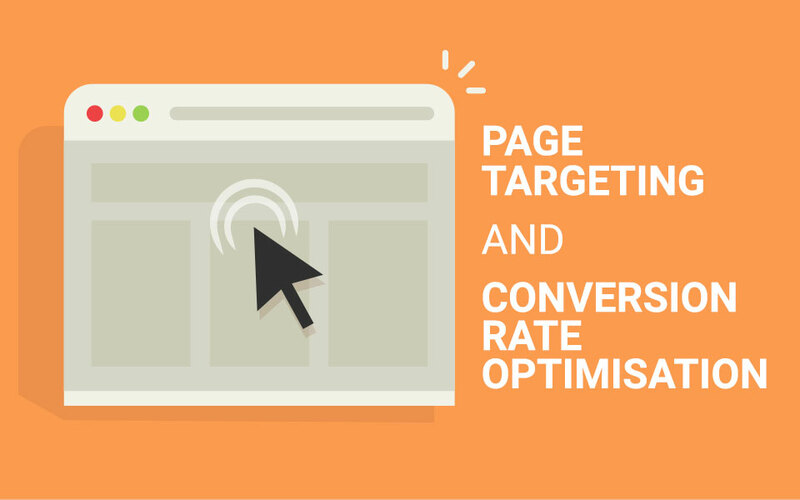 All the page targeting in the world is meaningless though if it doesn’t bring in the sales you need, so then, you need to look at your CRO. The more unique visitors you have, the more opportunities to close a sale you have — and that’s what we’re all after, right? Are your pages clean and vibrant? Are your graphics eye catching and appropriate? You want enough information to interest your customers, but not so much that your pages are crowded and messy. Play around with your pages until you find the balance, and remember that people will scroll down, it doesn’t all have to be on your landing page. Are your copy and checkout processes: easy to understand, concise and engaging? Do you have social proof? Customer engagement and reviews inspire trust. A great recommendation is your best friend. Trust and personal recommendations are often the difference between a mediocre and a fantastic website experience. And is your site running quickly enough? A slower website will have a higher bounce rate, if your competitors are faster and easier to access, it’s more likely that they’ll land the sale before you do. None of the above are big things, but constantly re-evaluating is what keeps your offer fresh, and that’s what you’re after. Because, not only are you keeping existing customers interested, you’re also bringing in more potential customers every time. Because, as hard as it may be to hear, just because your social strategy worked before doesn’t mean it will now. Trends are changing, and so are you and your products. This is good, it means you’re growing, you just have to make sure that everything is kept up to date. It’s just chaos theory in practise, little things having big results.